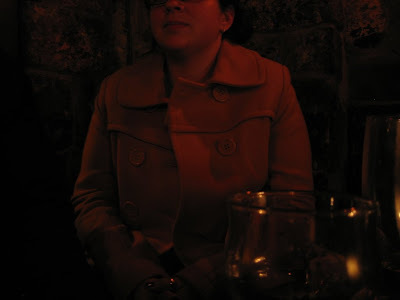 Here's me one year ago this week, hanging out in an Irish pub in Ennis, County Clare. Notice the lack of Guinness in my hand. That's right, one year ago this week, I peed on a plastic stick that would change my life. Unlike all those plastic sticks I had peed on just cause, well, you know. Who doesn't like to pee on stuff. Becoming pregnant was lots of fun for me (ahem); I had a very easy time of it. We made it on the first try, no morning sickness, no scary test results or bed rest or anything like that. Other than being so far from our friends and family for the first 6 months, it was a real cake walk. Even the distance thing wasn't so awful, I found a real great support network in Dublin that continues to be a part of my life back in the states. Nothing can really prepare you to go from this to this. Read all the books you want, go to all the classes, bug your friends and read the blogs and adopt an exceedingly needy dog and you still won't be ready to be a first time parent. Thankfully, they're too cute in the beginning to get rid of, and by the time the cuteness wears off and the sleep deprivation sets in, you've already bonded so you have to keep them. God is very sneaky like that. I've been a mom for 112 days and 5 hours. I'm pretty sure that's longer than the time the people in Lost have spent on the island. I won't even try to count how many diapers or bottles that is, although I thinks it's 2,417,236 and 1,284,702 respectively. It's one hell of a lot of spit up, buckets of tears (baby and mommy tears both--the baby tears are tastier, according to Ozzy), and an awful lot of bouncing and jiggling (maybe that explains the copious amounts of spit up?). 112 days and 5 hours of totally awesome. One year of having Samson in my life, and it has been fantastic. Even the emotional roller coaster bits, the hormonal changes, the extra 35 pounds. Let us celebrate this amazing year with a new batch of pictures and a giant ice cream sundae. So should I wish you a "Happy Pee-versary"?? Does Hallmark make such cards? Amy! I mean, Anonymous Blog Commenter! What if your daughter read that comment? If she could read, anyway.